Most wedding and event planning businesses offer Day of Coordination, Month of Coordination or other such “event coordination” packages. It appears that each potential client I talk to about this service, seem to have different expectations of what the package entails. So, I am here to explain what Boutiq Weddings & Events‘ Month of Coordination package entails and what you pay for when you hire us to enhance your special day. Alexandra, our head planner, meets with you at least twice in order to get to know you and to understand what it is your expectations are for your special day. The first meeting is a general information session which lasts approximately 1 1/2 hours. The second meeting, approximately 6 weeks prior to the big event, lasts at least 2 hours and we create and discuss a timeline as well as we choreograph a ceremony processional and recessional. She is also available during your planning time if you have any questions or concerns about etiquette and traditions and/or to answer any questions or dilemmas you may be having during the planning process. 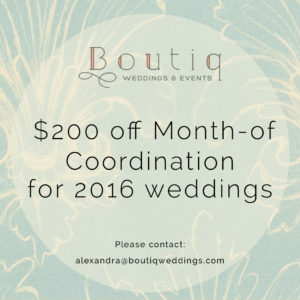 Boutiq Weddings & Events has an extensive preferred vendor list that has taken a number of years to put together. All the vendors have been vetted and provide excellent products and services. Signing a contract with us gives you full access to our list. If there is a vendor that we do not have, Alexandra will find you who or what you need in order to enhance your day. Once Alexandra has all your information, she sits down and writes out an extensive timeline that may consist of 3-4 drafts depending on the changes that might occur leading up to the big event. All of this, of course, is approved by you. Then the ceremony processional is written out and sent to the Marriage Commissioner for his/her approval. She may also have to touch base with some of your vendors to make sure that they are on the same time schedule. Approximately 7-10 days prior to the event, Alexandra confirms all final numbers with the venue/caterer and confirms all vendors. At this time, she will also write out an extensive production schedule so that she and her staff know exactly who is arriving when, where and how everything is put in place as per the client’s request and how the process will unravel. All these procedures take at least 5-6 hours of time on the computer and the telephone. Once the big day arrives, Alexandra and her staff expect work a 12-18 hour day setting up, managing the event and then taking down. Dealing with problems that come up, attending to last minute details that were forgotten, coordinating vendors, helping out with getting the guests settled are also part of the day. Once all is said and done, Alexandra returns rented items to the appropriate vendors. Experience and know how….other than the list of service above, you also pay for the knowledge, skills and experience that your planner has to offer making your day an enjoyable one. Often, things go wrong during an event, but you the client, don’t know about it because it was handled by your planner. Boutiq Weddings & Events Month of Coordination package starts at $1800 and can go as high as $2300 depending on the number of guests and the location of the event. 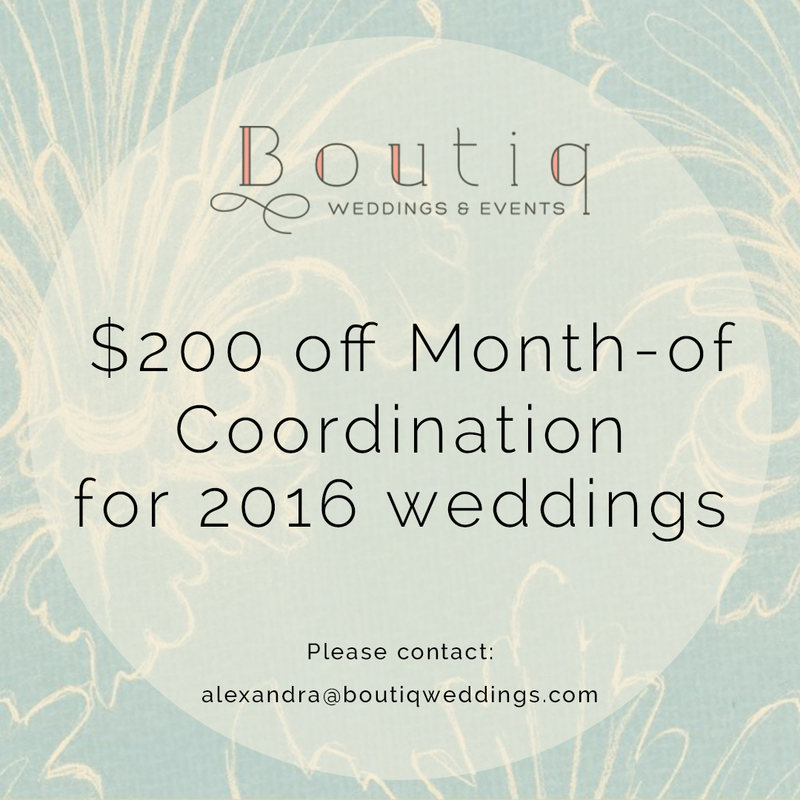 Right now until the end of May, we are offering a promotion of $200 off for all 2016 clients. Treat yourself to a stress free day filled with wonderful memories and hire a planner to take care of everything.